The DMT Collection presently includes over 150 artworks painted by some of the most know artist in Lithuania. Lithuania is a small and very unique country hidden on the Baltic coast of Eastern Europe. This mysterious nation of no more than three million for generations produces some of the most beautiful works of art in the world. From amber and clay to wood carvings and paintings, Lithuanians created incredible works of art that to this day continue to fascinate all those who see them. This publication introduces one of the largest collections of Lithuanian art in the world. Readers will feel that they are taking a tour of a beautiful Baltic country, learning its history, culture and art. The entire Lithuanian nation is presented like never before through the paintings in this vast collection. Overall, this publication presents a rare glimpse of modern Baltic art within the region, where each artwork serves as a guide to Lithuanian culture. All of the paintings were done by artists living in Lithuania. 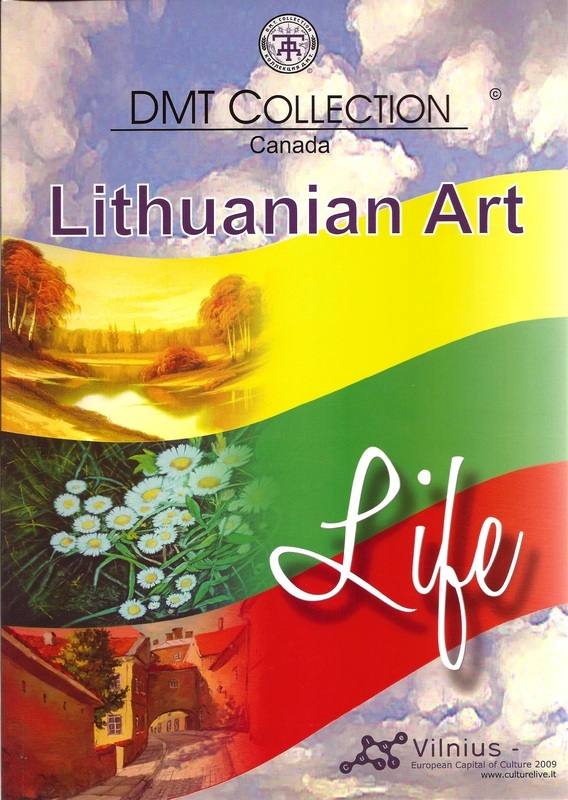 The whole collection is united by the theme of Lithuanian art and divided into several groups such as nature, flowers, animals, old city and architecture, marine and more. Every group is represented by about 30 paintings; the style of all works is variable. The collector, mostly accenting realism, has included a number of paintings illustrating abstract, romanticism, impressionism, modern and baroque, to introduce Lithuania as a nation of art in all aspects and styles. Almost all of the paintings were acquired during 2004–2008, with most of them being created during that time. There are, however, a number of paintings that represent earlier period, of the ‘90s, mainly by the famous artist Yuri Tarasov (1929–1998). It should be mentioned that every painting has been framed using top museum-quality frames that were individually selected for each work of art based on overall compatibility with the painting’s image. Bearing in mind that almost all of the paintings are rather large (1–3 meters in length and 0.4–2 meters in height), the cultural and financial value of each composition, painting and frame, is substantial. Another important aspect is that every painting has full legal documentation, from the moment it was acquired as well as confirmed history of origin (full provenance), which is very important not only for any art collector but for the Lithuanian Nation in general. Complete Copy Rights were acquired for most of the artworks and agreements with the artists limiting copies of many of the paintings were made; for more than half of the collection the present artworks are the only copies that will ever exist in the world. The core of this collection is complete and ready to be presented to a worldwide audience, but of course, this is not the end of the endeavor. Now with even more precision and selectiveness the collection will slowly grow and develop into a global art gem. There aren't many, if any at all, private collections in the world with a such large amount of Lithuanian art. This collection will always be a unique Lithuanian jewel in the whole world. Lithuanians by nature are very artistic people. Their culture is a complex structure with many sides and angles; however, art was and always will be at the forefront of this nation. Their ancestors cut figures and jewelry out of amber that today’s archeologists consider national and world treasures. Lithuanian pottery skills, passed from generation to generation, are like no other, and attract tourists from around the world. Folk-art and national costumes, decorated by traditional design, show sophisticated culture even in the most simple of souvenirs. Lithuanian woodcraftsmen are true masters of their trade, creating incredible mysterious, strange and beautiful totems and statues on various themes, from Christian crosses to bizarre devil statues. Lithuania, although a Christian nation, was the last in Europe to adopt Christianity, so everywhere you look ancient pagan traditions and influences remain strong. Roman Catholics are the dominant religious group, but all other faiths and pre-Christian traditions live in a close symbiotic relationship, allowing Lithuanians to visit Church on Saturday and on Sunday drive for a picnic in the open-air “devil park” in Klaipeda. This diversity of believes has had a profound effect on Lithuanian art, allowing Lithuanians to be faithful to their religion yet totally open to the art they create. To say exactly what separates Lithuanian art from that of its neighbors or other countries is a difficult task, not because there isn’t any diversity but because there is so much; to take upon oneself this task is a large responsibility, to say the least. True ethnic art in Lithuania – whether painting or sculpture – is very different from other art that is created in this country. There are many styles of art that the Lithuanian nation uses to portray its culture, yet the true theme of Lietuva (Lithuania in the native language) is hidden in the name itself. Lietus in Lithuanian means rain, so Lietuva may be understood as “Land of Rain.” Although Holland may experience wetter climes, and hot summers in Lithuania are not a rare event, rain, hail and a dark, gloomy climate are common in this part of the world. Possibly in ancient times this region was truly a land of rain; perhaps it was then the theme for Lithuanian art was formed. However it happened, it survived to this day, maybe in different forms yet still in the same colors. So what is Lithuanian art? To explain art in words is like trying to sing on paper; the best way is to travel and see it for yourself, but as many don’t have that opportunity, an attempt must be made. Lithuanian ethnic art is different first of all in its colors – colors that perfectly represent the Land of Rain. Different artists, from different time periods, sometimes of different nationalities, are driven to the colors of the rain. These colors don’t necessarily represent wet conditions, but it is certainly the overall impression of artworks created in this style. The colors of Lithuanian ethnic art are rarely bright and vibrant; they are usually darker and muted, as if under dim light. Even when white and yellow are used, still the artwork remains in shadows and mystery. Regardless of the colors at use, such artworks have a specific theme – and whether it is brown, blue or green, the artists manage to use endless variations of that same color in very different shades, creating perspectives of depth, illusion and distorted reality. Sometimes images appear masked by unclear brushstrokes, yet the artists rarely intend to show reality as it is. When viewing ethnic Lithuanian paintings, one feels as if he is in another dimension, while nevertheless in the same world. Everything is the same but different. Even when colors remain the same, a familiar street suddenly transforms into an 17th- century passage; a known landscape becomes a futuristic land, as if the dark, rainy Lithuanian climate has captured the artists’ souls, forcing them to paint this way. Artists try to escape in their art by painting the same, still faraway land; creating new worlds full of mystery, uncertainty, romance and hope while never breaking out of their hypnotized state of color. The second defining aspect of ethnic Lithuanian art is the shapes and dimensions that are given to the objects at play. It is difficult to find clear lines and symmetry in these types of paintings. Clearly the artists were guided by Impressionism, but somewhere crossed path with Romanticism, Futurism and even Realism. Objects in their art are usually either simplified or exaggerated into shapes with very complex internal structures. In other cases images of objects within the artwork are twisted and stretched as if the artist’s thoughts were passing through a broken mirror. A final defining aspect is the emotions and thoughts that ethnic Lithuanian art generates. There are always exceptions, but most of these works are very emotional pieces that stimulate the thought process. While with Realism the viewer can almost instantly enter the artist’s world, in Lithuanian art one is struck first by the many emotions that come up. Moving from uncertainty to curiosity, one has to understand and get comfortable first and only after a few minutes begin to unravel the artwork. Other artists in Lietuva show emotions by distancing themselves through difficulty of composition. While staying within the borders of the ethnic style, their art portrays seemingly simple images emphasizing a purity of emotions, behind which the more complex color patterns of the background are seen. In such art, colors play a secondary role, supporting the emotions of a creature depicted in the painting. A happy cat with a satisfied smile, showing simultaneously human and animal emotions, might be surrounded by colors of warmth – even if they are black and gray. Another composition of sadness will have colder and more distancing colors. Still, the main emphasis is on the central image and its simplicity, showing emotions that are highlighted by a more complex background. Ethnic Lithuanian art has as many variations as the artists themselves; to write about all of them would take much more than one publication. Nevertheless it is important to know that in addition to the other styles of art presented in it, Lithuania has its own unique way of painting life. In 2015 we added 40 unique paintings to our collection!